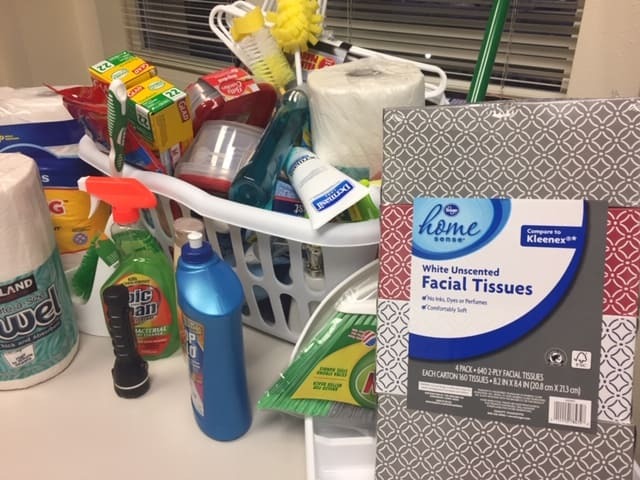 Home » News » Housing Authority staff donates household items for New Path Community Housing. Twin sisters at Homedale High School recently decided on their Senior Project, a requirement for graduation that will benefit the community. They decided to help the new residents of New Path Community Housing in Boise, residents who will soon be moving into Idaho’s first “housing first” community. These residents will be coming out of homelessness and will now have a new home in a brand new community. Since coming out of homelessness can also mean not having common household essentials, the Carter sisters had the idea of providing welcome baskets. Only these are not your normal welcome baskets. They arranged to have 40 laundry baskets (one for each apartment) delivered to local businesses and sponsors, and asked that they be filled with everyday household items, things most of us take for granted. And they were able to find sponsors for all 40 baskets. Additionally, the high school football and volleyball teams have joined in the effort by helping to move furniture into all the apartments, assemble pieces and arrange the homes. The staff at Boise City / Ada County Housing Authorities filled one of these baskets. The project was a fun way for our staff to make a genuine difference in something very close to our hearts and it bought out much conversation about how easy it is to help those most vulnerable in our community. We are thankful for the inspiration of the Carter sisters and all the young people of Homedale High.